This safari jacket, made by London shirtmakers Budd, was born out of a desire for a soft, unstructured layer I could wear over a shirt or T-shirt in the summer. Often such things are referred to as shirt-jackets. They have no structure whatever, like a shirt, but have external pockets to perform some of the practical duties of a jacket. The problem with safari jackets is that they often look rather colonial, and middle-aged. That is partly down to colour, which is usually sand for authenticity. Another, perhaps more important reason is the fit. Presumably in the belief that such jackets must be ‘easy’ fitting in order to remain cool, they rarely have any suppression in the waist and large, blooming sleeves. The way to avoid this is to go bespoke. With tailoring that’s a rather expensive choice, but with a shirt-jacket it’s not. My jacket from Budd cost £395. Still a lot of money, but a lot less than a £3000 suit and not much more than a £225 Budd shirt. Darren Tiernan, the head cutter at Budd, was clearly interested in my suggestion of a safari jacket, but also understandably wary. Few bespoke craftsmen like stepping outside their comfort zone, usually because the refinement of their craft is concerned with perfecting an established process. We started off big. 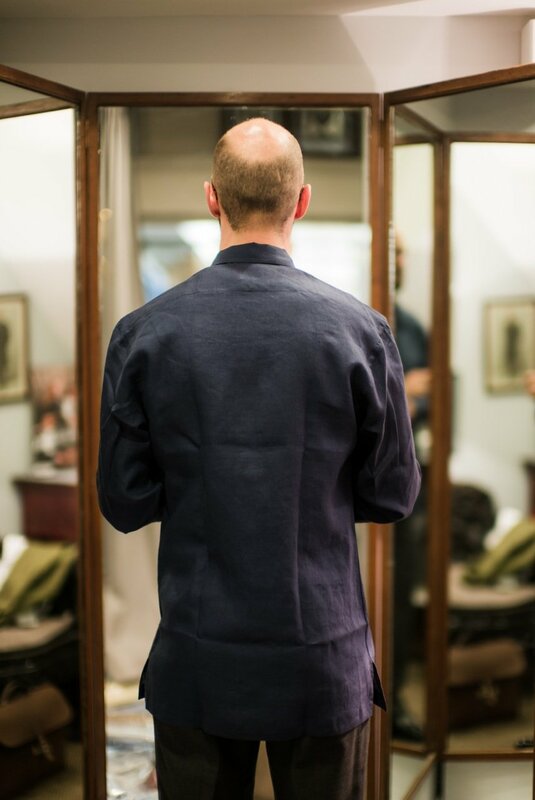 A test shirt was made in cheap, navy linen, with Darren cutting most of the measurements a size bigger than a normal shirt. 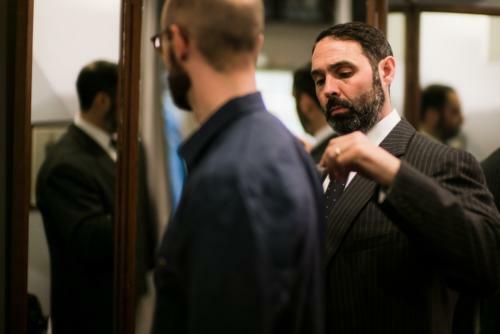 At the first fitting we then cut a lot of things down: the shoulders, by a quarter of an inch, the chest and waist, by around a half, and the length, by a whopping two inches. It was worth being conservative with the initial shirt for two reasons. One, because of the sheer uncertainty of how we both wanted it to fit. And second, because as with any shirt it is always a lot easier to reduce the size than to increase it. At the second fitting, things looked a lot better. The length was more that of a jacket, rather than a shirt. The pockets had been moved up in proportion, and the hip pockets enlarged to be more similar to jacket patch-pockets. We also shortened the sleeves and took some of the fullness out of them. The only thing we couldn’t change was the button placement, because the buttonholes had already been cut for the first fitting. That’s why their position looks rather odd. I have to say that at this point I was very interested by the project, but a little uncertain as to whether I was going to like the final result. 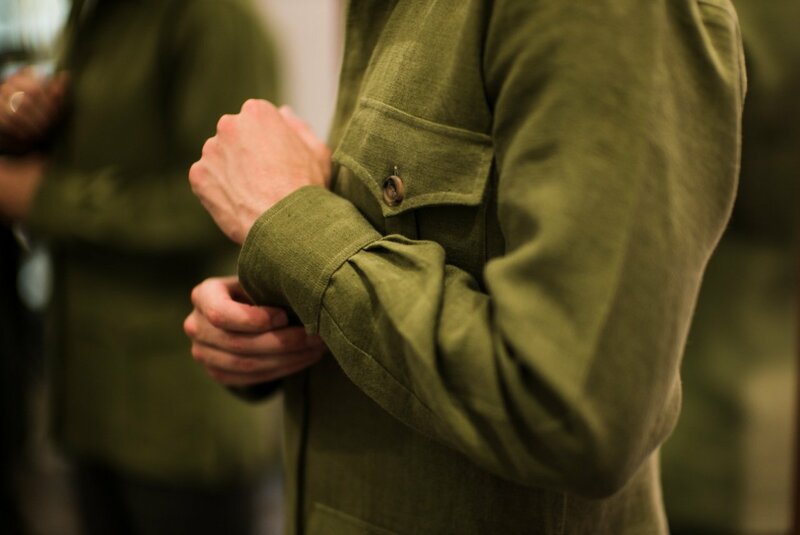 That all changed when we had the shirt made in the final material, a 265-gramme army-green Irish linen from John England. Suddenly, it all fell together. A little more slimming in the waist (two darts) some more out of the top of the back, and it was complete. We had trouble finding that linen. There are only a couple of bunches of decent-weight ones and neither offered a satisfying green. I credit Darren with finding the John England samples, which for me really made the garment. After a dozen wears so far (and one wash) it has softened nicely and feels extremely comfortably over either a T-shirt or shirt. The key to wearing it seems to be undermining those colonial associations, by loving the wrinkles, leaving most of the pockets unbuttoned, and often leaving the cuffs loose. I’ll take some more photos to demonstrate in a week or two. More back story in my How to Spend It column. 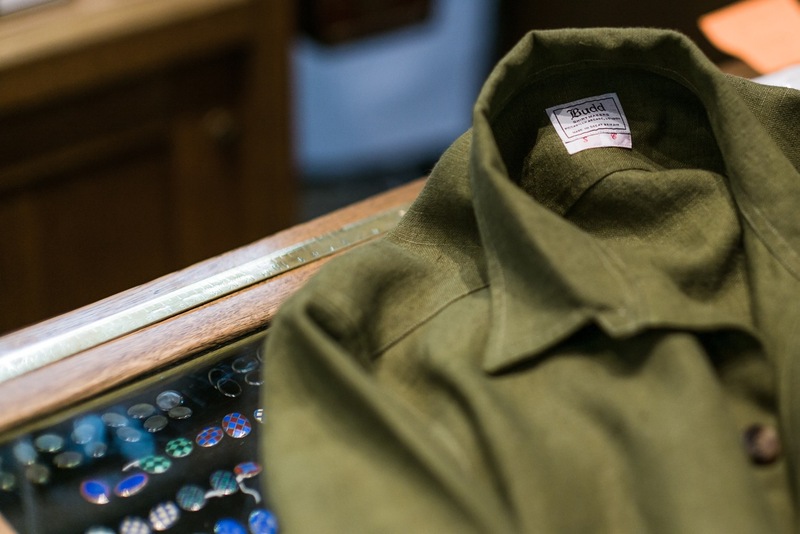 You can follow the discussion on Bespoke safari jacket – part 1 by entering your email address in the box below. You will then receive an email every time a new comment is added. These will also contain a link to a page where you can stop the alerts, and remove all of your related data from the site. Very inspirational – came together great. What was behind your decision to only have one breast pocket? Most shirt/safari jackets I’ve seen have two. Also, why did you decided on a hidden button placket? Hidden placket because a lot of safaris have this detail and I think it added a little smartness. Without it, there would be a lot of buttons on the thing! Make sense, thanks. I’m thinking of using mine for hot weather travelling, so an extra front pocket might come in handy. If you don’t mind me asking, what measurements did you use for collar and pockets? Nothing rigorous I’m afraid. Darren initially worked with shirt pocket sizes and we enlarged the hip ones after the first fitting. I really liked this jacket. What is your opinion of wearing it with a knit tie and a shirt in the summer for attending the opera in Verona and similar summer fun? Not sure about the formality of the opera attire (although I did go to the opera in Verona on my honeymoon years ago). First time comment, long time lover of your blog sir. I love this, in fact I think I’m going to have to buy one myself! It’s funny, I too have always associated these with men of middle-age; my father, being of Trinidadian descent, has many variations of these “Shirt-jacks” (as they are known there) although his are all in cotton; I think the linen and the colour are an inspired choice. Great project and final execution, congratulations. Perversely I think I might have preferred it in navy, cut like a field jacket, but that’s just me. Great jacket Simon, very unique. I know you are not a big wearer of t-shirts, as a main clothing item, but may I ask where you get yours from, Albam/Sunspel perhaps? This shirt jacket is one of your better ideas,love it! What other color would you recomend for Summer? I’m wondering if this same idea could be made in a lightweight wool for those initial cool days and nights Autumn? 2 points….firstly the bottom pockets are particularly noticeable. Secondly , you mention wearing it with a shirt ….wouldn’t the jacket collar and shirt collar be a bit too much . Unless one went for a grandfather , collarless shirt. Certainly an item you should consider merchandising , possibly in a tan and navy blue colour as well. No I’ve found it works with a shirt – and with a polo-collared sweater like the Dartmoor as well. I’ll publish some pictures in a part 2. Really like the idea of this jacket as well as the color; however I do think it looks a little unbalanced without the second breast pocket. In addition, it’s always nice to have extra pockets. Very very nice. The colour is excellent. I might have added a breast pocket on the other side for symmetry, but that’s a minor stylistic quibble. It looks like you went a little shorter than a normal jacket length. Can you launder it rather than dry cleaning? In reply to Scott, I recently had something very similar made in a lightweight wool for the autumn. I went with a lightweight tweed herringbone in brown/olive. After seeing these pictures, I’m tempted to get another one made in linen. Yes, you can launder it normally. i think the collar could be bigger.its fine for a shirt, but this is basically outerwear. What do you think? This is definitely a lovely Safari Jacket. Interestingly enough, the one breast pocket insead of the usual two lends it an overall shape, designing-wise, that most sartorialy-inclined folks could easely embrace. This is really a worth-considering innovation. Fabulous Simon and what a colour. Some images of it after wearing would be appreciated to see how noticeable the creases really are. What was the weight of the linen? Coming from Zimbabwe i remember middle aged men all wore safari suits but the material was always crisp and non-creasing and in beige/cream. What would the original material have been out of interest? Please don’t change a single detail. Proportions, placket, and SINGLE breast pocket are brilliant. This is a great one, Simon. Perfect colour. I’m not a fan of the asymmetry personally, but each to their own. Richard James’ blog previewed several pieces in this manner a while back, should anyone be interested in RTW alternatives. He’s doing a ‘Desert Rat’ collection for SS15. Great colour, cut and cloth. Some have raised the asymmetry (a personal choice) I therefore wonder whether a gun shoulder patch (perhaps chocolate brown linen or suede) would balance the look, add a sporting twist whilst avoiding the need for another pocket etc. It would also give a nod to the original intent of the jacket. The current design might suggest a slight uncertainty in the intended character of the garment as the single pocket reflects a shirt rather than jacket. Further additions might include some brown trimming on the collar and cuff ends….but perhaps simplicity is the key. Yes simplicity was the aim here, and getting away from any colonial/hunting/military associations. I really appreciate the shirt-jacket concept (it makes sense, that´s all I need to appreciate a concept) but I often lost my interest somewhere between the concept and reality. This is definitely not the case! I really love this jacket! I tried to do have something similar made myself, several years ago, with a heavy olive linen and a brown lining. Being utterly uninformed about all things sartorial, and using a cheap tailor in Vietnam, the results was ok enough for a few months but quickly started falling apart. This post makes me want to have another go – hope you don’t mind me stealing the idea! Great to explore more casual wear. What about a version in flannel? I did mine in Camiseria Burgos Madrid for €350 and you can make your own design, they also make Guayaberas. They sent me some fabrics samples and I sent my measurements, awesome¡. This is a beautiful commission Simon. I really like it. I would like to have my local shirt maker that I use here and there, CEGO, create me a safari / field shirt jacket. I am under the impression that a standard linen from a fabric book that would typically be used for shirt making will not work? Is this correct? I am also dreaming of a suede field jacket. Brioni, Isaia, and Liverano make some beautiful jackets like this. I would opt to go bespoke due to fit. Do you know any other makers that make such pieces? Hi Simon – a huge fan of your work and this post has got me thinking about commissioning a shirt(safari) jacket myself. Do you by any chance happen to know if Huntsman would be open to making one during a trunk show? I admire your bespoke safari jacket. I am considering having one made by my shirtmaker in a style similar to yours. I have a few questions. Is your jacket completely unlined, even the arms? I imagine sliding ones arms into an unlined linen jacket is less smooth than a half-lined linen suit and it could cut down on wear if they arms are lined. Any lining, though could defeat some of the purpose and make it more expensive as well. How has yours stood up to wear and how frequently do you use it? Yes, it is completely unlined. It should be thought of as a heavyweight safari shirt really, rather than a jacket in that respect. You could line it, but as you say that would cut down on some of the breathability. 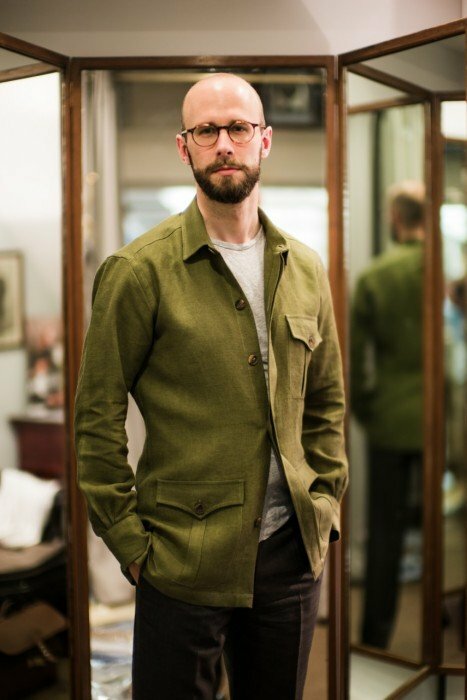 Hi Simon, had a safari overshirt made (8oz linen) and wore it to the point where the the fabric above the vents are on the verge of tearing. The rest of it though is nowhere as worn. Is there a way to fix this or am I better off just getting another one made perhaps in a heavier weight? Thanks. It does not sound expensive. Is it all hand made? Would a tailor not charge more, as opposed to a shirt maker? Hi Simon, what color(s) would you recommend for a safari jacket? I was thinking of going for a tobacco brown, do you think that’s too old fashioned?